The Kuwait K9 association trains dogs and provides information to owners on how to care for their animals. K9 is a numeronym that stands for “canine”, usually in reference to domesticated dogs. The term is most often used to describe working dogs, especially law enforcement and military dogs, in keeping with the military’s famous love of shorthand, acronyms and numeronyms. It may also be used in animal shelters to quickly denote “dog” on notice boards for the purpose of protection and keeping track of the animals in the facility, as the animal’s name may not always provide a clue as to which species it belongs to. Ayman Saad Murshed, a retired army pilot who is now the head of Kuwait K9 association, spoke to Kuwait Times about the association and the art of training a dog. Kuwait Times: How long have you been a dog trainer? Murshed: I started when I was 17 years old, and I always take my dog wherever I go.When I retired, I owned 25 dogs, 20 of them German Shepherds and five Rottweilers. I then entered the K9 world by traveling to Germany twice a year to attend the world championships and buy new breeds. KT: When did you start the Kuwait K9 association? Murshed: K9 is kind of an activity to train dogs to guard. As an army pilot, I had friends in K9 units who taught me this kind of work and with a lot of reading and learning, I started my own organization in 2014. KT: What are the procedures to join the Kuwait K9 association? How many members do you have? Murshed: We have 95 members aged 18 to 65. Membership is free, and anyone can join us, but first I have to know about their dog, date of birth and vaccinations.A copy of the civil ID is needed to check if applicants have a criminal record or not, because training dogs to attack someone could be dangerous if someone has bad intentions. 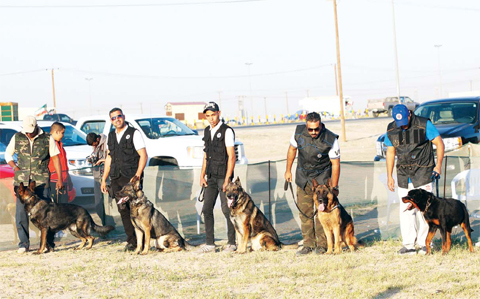 KT: What does the Kuwait K9 association do for its members? Murshed: We have a group on WhatsApp to exchange information and our experiences about dogs. We also gather once a week to talk about what is good for dogs. We started our own competition with the participation of judges from the global canine organization Federation Cynologique Internationale (FCI).We also have an outstanding dog show where various types of dog breeds and types take part. KT: What mistake do you see owners commonly make? Murshed: Owners do not understand that raising a dog is a great responsibility, especially if you have children.You must know more about the breed that you are raising. For example, a German Shepherd is a strong and friendly dog that can be raised with children,unlike a Rottweiler that considers itself as a member of the family.If you make it angry, it can attack you, and if it likes you, it will protect you. But children cannot treat it properly, so if a child plays roughly with a Rottweiler, it could attack the kid. KT: Any advice for new owners? Murshed: Owners must read and know more about their dogs, about the food they eat, training, habits and so on. KT: What’s the most important cue or command to teach your dog? Murshed: Basic commands like how to come, sit, stay and even go to the toilet will nurture your relationship with the dog as well as encourage good behavior. Well-trained dogs are less likely to stray, and generally lead more comfortable and fulfilling lives compared to their untrained counterparts. KT: Do you give private lessons or group lessons? Murshed: We provide both, and dog owners can join us in our group to learn more and get one of our private dog trainers to train their dog. KT: How old should children be before a family gets a dog?Are some breeds better with kids? Murshed: A child should be at least 12 to know how to deal with and treat a dog right. Small dogs are better for children than large, wild dogs.